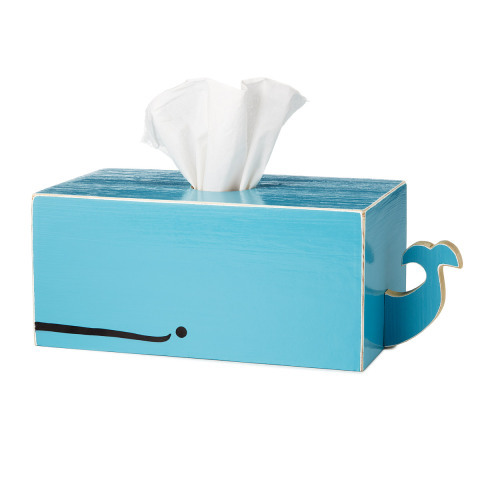 feel just a little bit better with a Whale Tissue Box Holder? This cute blue whale is hand made of wood by a woodworker is Auburn, California. The tissue is fed through his blow hole to make him look like he is spouting off all the time. His gentle grin will help make getting though that illness or allergy attack just a little easier. Or perhaps he could help you take off your make-up at the end of the day. The whale is also a great accent for a bathroom with an ocean theme. He'll make sure that any guests to the room will have a whale of a time. To order a Whale Tissue Box Holder for your home, click here.